I have waited a long time for the tiller project. I've always figured that if I am far enough along in the overall restoration timeline to be able to focus on the tiller things will be good. It's certainly not 'Miller Time' yet because I still have much to do, but I felt like I could take some time to do a fun project like building a new tiller. 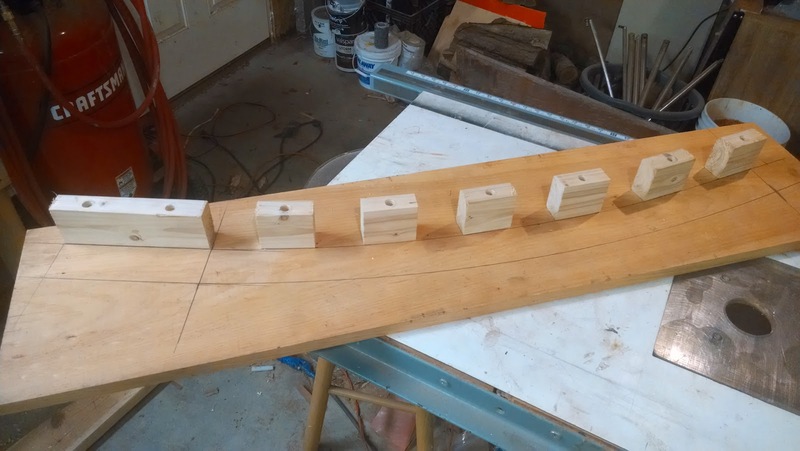 I didn't really have anything to go on for size, shape, or length of the new tiller other than the dimensions of the rudder head assembly (2 1/8" wide x 8" long) where the tiller connects. To find what might work for these dimensions, I grabbed an old 2x4 and marked where I thought the length should be. I knew I wanted to have a pretty steep curve in it so legs could fit in the cockpit when underway, but for this I just guessed. I probably should have made up a real template, but I didn't and basically winged it. One nice thing about the rudder head assembly is that it has a height adjuster screw so you can raise or lower the height of the tiller, so I figured that I have some leeway to just be creative. 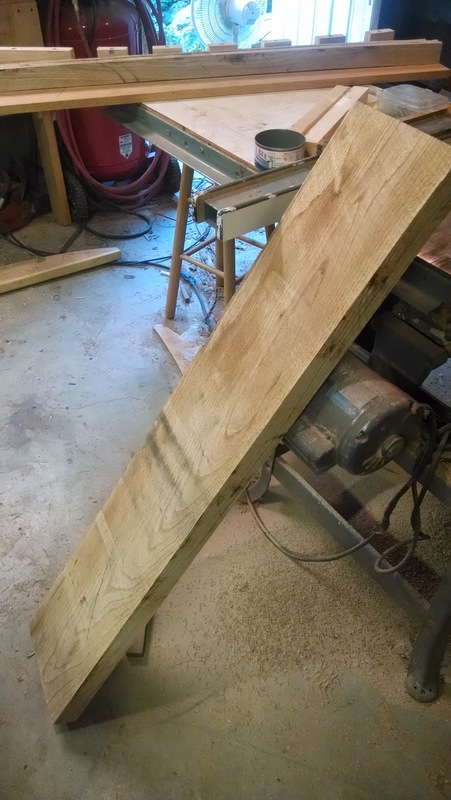 Once I had the length figured out, I went back to the shop and started tearing into the big 2"x10" chunk of Ash I picked up at the local sawmill the day before. I chose Ash because it has a bunch of properties that make it really good for tillers. It's strong, flexible, and best of all: cheap (at least compared to the exotics). I was able to buy a 2" x 10" x 6' piece of it for $50 and have a lot leftover for other projects. Anyway, after cutting it to length (with lots of wiggle room), I ripped a bunch of 3/8" strips for the curved lamination. Those Emerald Ash Borer beetles are nothing compared to what I can do in the shop. I also had some scrap Sapele leftover, so I cut that down to roughly the size of the Ash strips so I could have an accent strip (I wanted to add a little creativity). A lot of people do alternating layers of Ash and Mahogany, but I never really cared for that look. Once complete though, the tiller will certainly not look off the shelf. 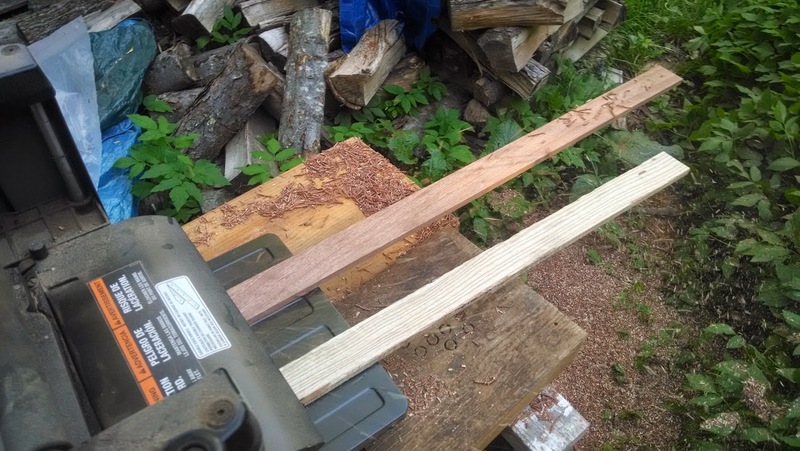 I ended up cutting 8 strips total (7 Ash, 1 Sapele) and ran them all through the thickness planer until I got 3/16" strips that were nice and bendy. A note about my thickness planer; I bought it on sale for $200 a few years back (Porter Cable 12" PC305) after reading questionable reviews and wondering about its durability. I have used it with many types of wood and this planer has been great. 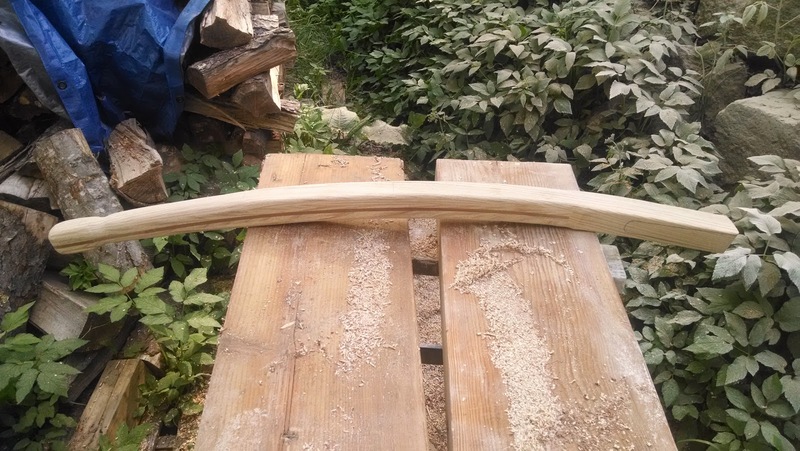 It produces a nice smooth finish with no tear out (except I once attempted to shave some maple down a little too much) and little or no sniping as long as you support the piece entry and exit. 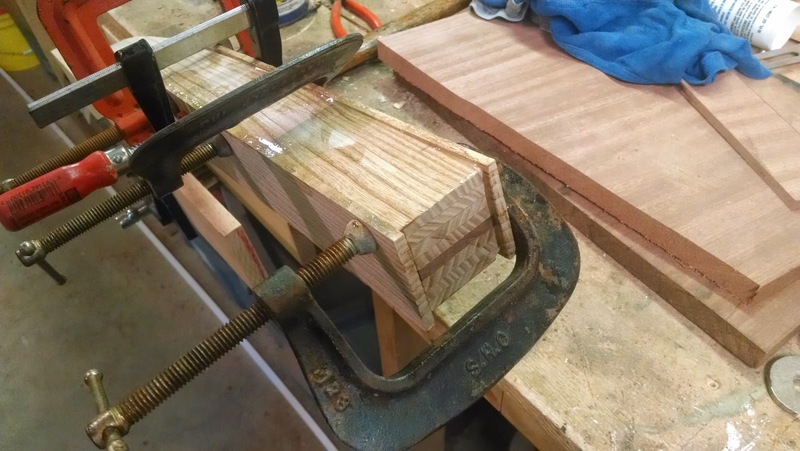 I built a lamination form with some old 2x3s blocks and a pine board I had lying around and screwed them to a fair curve I had drawn onto pine board. I test fit all the strips in place and then mixed up about 4 oz of epoxy and brushed both sides of each strip before placing on the form. I lined the jig with plastic cling wrap but this is just a messy job and intially is not pretty. 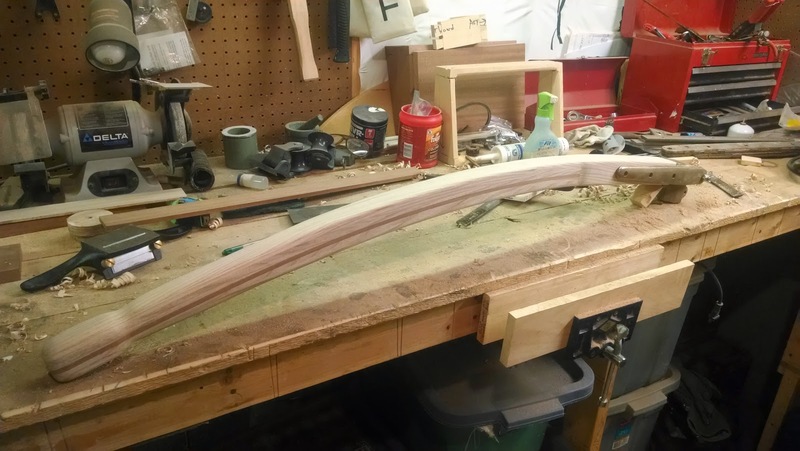 It's always a bit of a challenge wrangling 8 slippery pieces of wood onto a curved form that they naturally don't want to bend to. Eventually I got it done and clamped up, but I always worry that my epoxy may kick before I get things into place and wreck it all. I let it sit for 24 hours to make sure it was hardened up nicely and the pulled it off the form and sanded off the hardened epoxy before running it through the planer again. I always love sending a rough piece of raw lamination through the planer and have it emerge as a lovely piece. It's very satisfying. 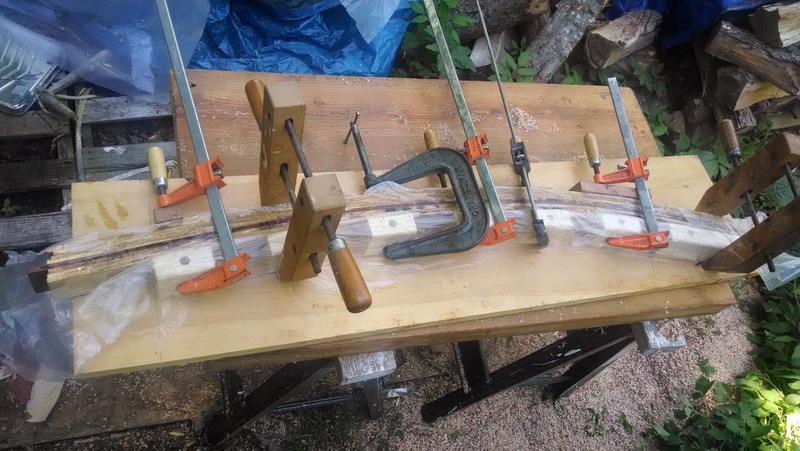 I still had one more lamination to do to finish up the basic shape because the Ash I had was 2" rough and once I had planed the laminated tiller down, it was about 1 - 7/8", but the rudder head assembly 'jaw' where the tiller bolts in is 2 - 1/8". So I needed to add 'cheeks' to the tiller. This was a bit easier since I was only working with 2 pieces at that point and they didn't need to be bent. I set the piece in the hot sun and after 5 hours it had hardened up to the point where I could work it. The cheek blocks I glued on were 3/16" on either side, but I only needed 1/4" to get the required width, so I hit them with my random orbit sander and some 60 grit paper and they were down to the 1/8" per side in no time. 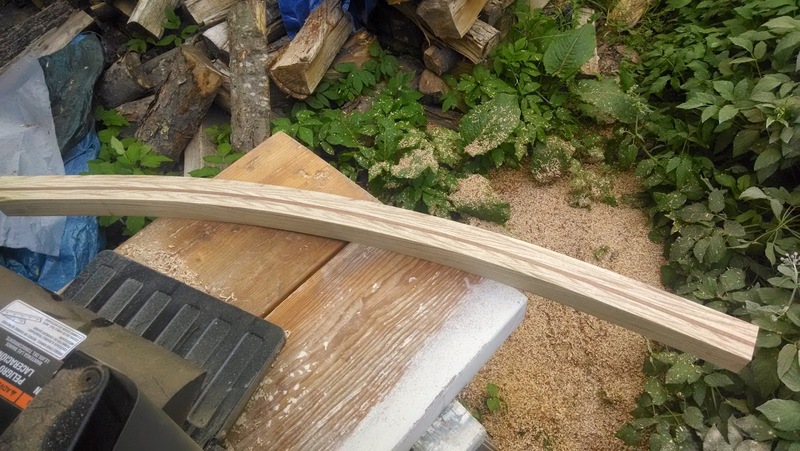 Now it was a matter of shaping with a block plane and a series of rasps. This takes a lot of time, but it's one of my favorite things to do. I think I must have been a whittler in another life. After several hours, I got it to a shape I liked and fit nicely in my hand. The kids thought it was pretty good, but my wife giggled and said it was too phallic. Ok, I think I'll have to work on it a bit more, but tillers just are kind of phallic, and I don't know how much I can ultimately change that, but I ran out of time for the weekend so I'll have to finish this week. Below is a picture of what I thought looked finished.